I first met Lydia and Will at The Bridal Market event in Kirkgate Market, Leeds (the one that made it onto the telly and has a really bad cameo from me in it!!). I created this vintage lace wedding cake for them. They had planned their wedding ceremony to be at a local church then the reception was at Cookridge Hall Health Centre, which has a lovely bright and airy conservatory which was decorated with tissue paper pom poms! They opted for a four tier wedding cake iced in ivory with a lustre dust to give a subtle sheen. Lydia had chosen a wedding dress by Mori Lee and we incorporated some of the detail from the dress into the piped detail on the cake. We made sugar dusky pink sugar roses and white hydrangeas to top the cake, with some trailing sugar foliage. A trio of sparkly brooches and a trim of dusky pink ribbon completed the look. We loved creating this vintage lace wedding cake for the happy couple. We love to create modern wedding cakes with sugar flowers. For more inspiration, why not check out these posts too? Laura and Chris had planned their intimate wedding at Cedar Court Hotel in Wakefield, and I was so excited to be a tiny part of it. Laura and Chris chose a two tier naked cake with fresh berries, which was topped by a gorgeous little bunting topper from Ginger Ray. The flavours of lemon sponge with lemon curd and lemon buttercream and vanilla sponge with strawberry preserve and vanilla buttercream will complement the fresh fruit, perfect for a sunny spring day! Sharon and Mark are one of the nicest couples I could ever hope to work with. I first met Sharon at the Casa Hotel Wedding Fair and she then came round for a cuppa and a chat with her sister. She had an idea as to what she’d like for her wedding cake, and we used this as a starting point. 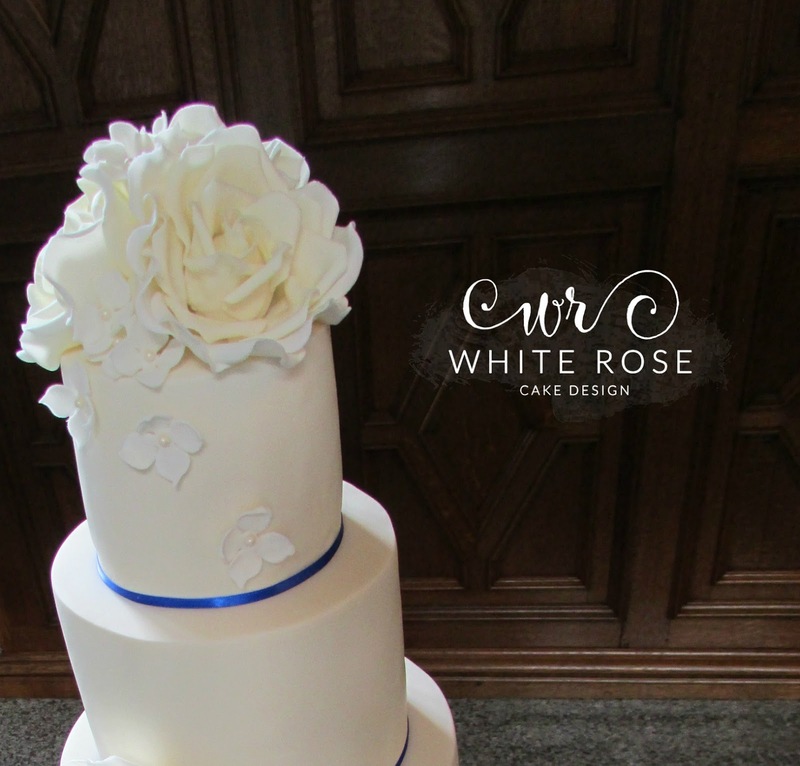 Sharon and Mark chose a rose cascade wedding cake, with white roses interspersed with teal ones. They got married at the Cedar Court Hotel, Huddersfield on what was also Sharon’s birthday, so we had to make her a birthday cake too! When the gorgeous Clair sent me a message asking for a quote for her cake, I knew it was one I really wanted to make. 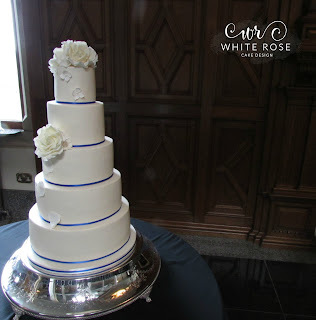 She chose an elegant ivory theme, with sugar roses and hydrangeas. Simple, elegant and understated – perfect! A beautiful ivory roses wedding cake. 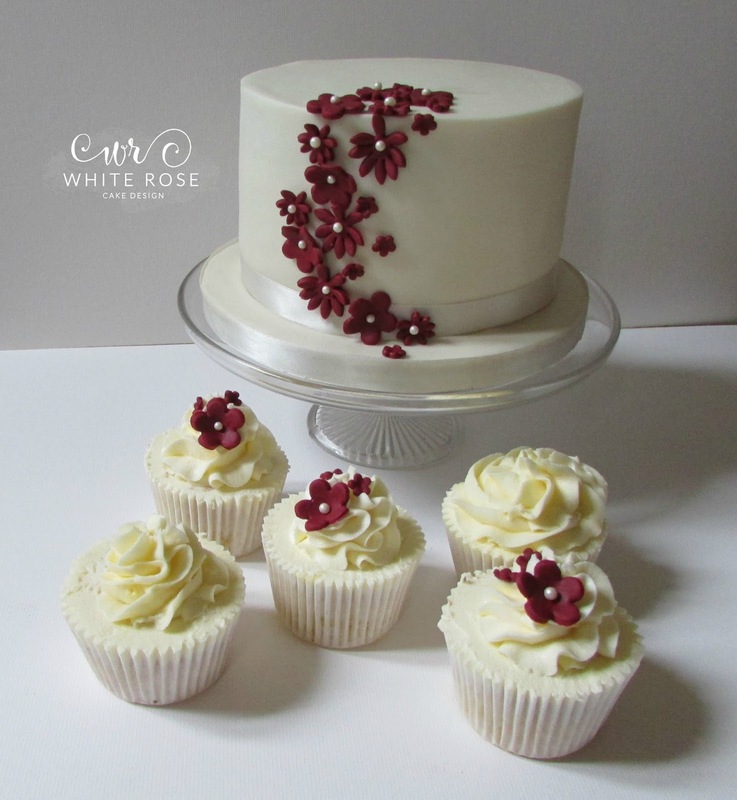 I delivered to the stunning Whitley Hall on the morning of Clair’s wedding, wincing every time I bumped over one of the huge speed humps in the car park! I presume they’re to protect the peacock that roams around the grounds 😉 The cake arrived in one piece thankfully, and I was able to set it up, all ready for the wedding breakfast. Here’s a cake we delivered to The Woodman Inn for Kayleigh’s wedding. Three tiers of lemon sponge adorned with the most beautiful real flowers provided by wedding florist extraordinaire Jane from Woo B Woo (www.woobwoo.com). For more of our cakes, pop by to our facebook page www.facebook.com/whiteroseweddingcakes or follow us on instagram @whiterosecakedesign. We hope to see you soon! 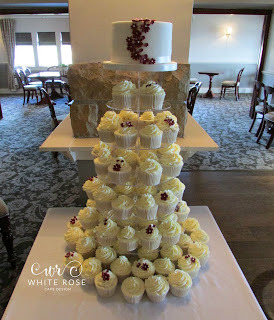 Liz and Ed got married at Casa in Brighouse which is a beautiful lakeside venue with a simply stunning function suite. They chose a rustic buttercream wedding cake adorned with sugar flowers in whites and ivories and a touch of pale green foliage. Displayed on our rustic log stump cake stand and then placed on a fabulous old vintage dresser. This stunning cake was delivered to the Saddleworth Hotel for Ruth and her husband who celebrated their marriage there earlier in the month. 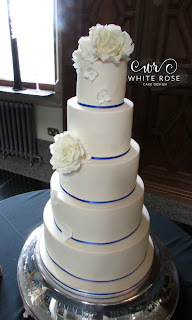 Handcrafted sugar roses and hydrangeas top the cake, which is finished with royal blue ribbon. 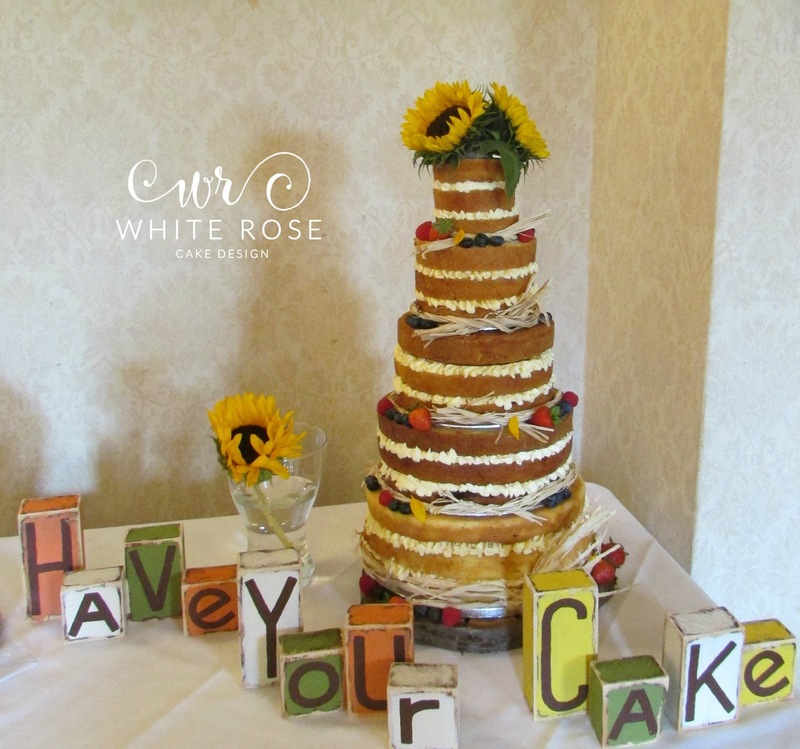 Hayley and James are one of the nicest couples ever, and I was thrilled when Hayley’s mum initially got in touch to chat about their wedding cake. 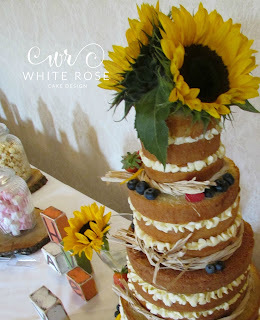 They opted for a five tier lemon and vanilla naked cake decorated with fresh sunflowers and berries. It went perfectly with their room setting, which they decorated themselves! Huddersfield Golf Club at Fixby is a beautiful venue for a wedding too. 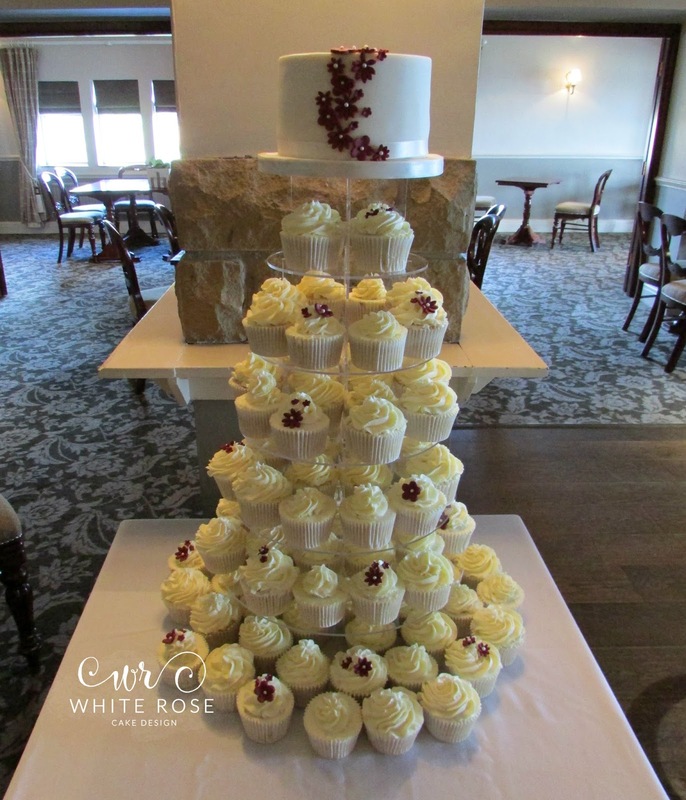 We created this beautiful cupcakes for Alex and her new husband who celebrated their wedding at Pennine Manor Hotel, Huddersfield. 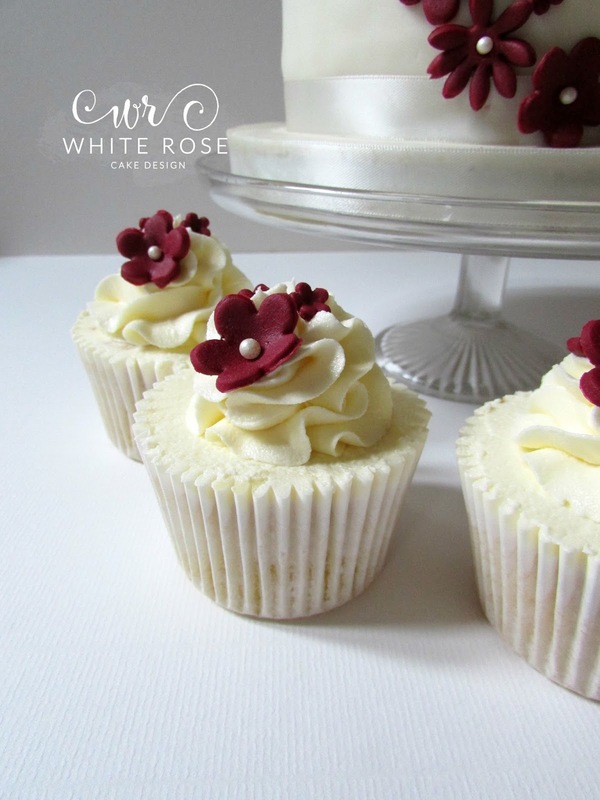 Alex had seen our cupcakes at her friend Leanne’s wedding, and knew she wanted something similar but in her chosen colours.